I'm not going to lie--I've been forced inside on the treadmill this winter with a little more regularity than I'd like. Part of that is a new work schedule; after eight years of working the night shift, I've gone back to a mix of days and nights. 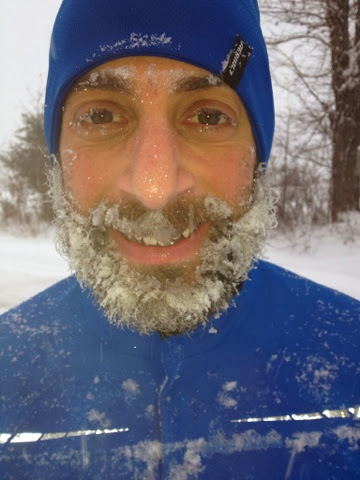 On days when I'm working at 7 or even 9 am, it's a lot easier to throw on a pair of shorts and stagger upstairs to the treadmill for an early morning run than it is to face layering up for an hour in single-digit temps. And I don't want to complain, but it's been damn cold here! I'm no big fan of the treadmill, but they call it the path of least resistance for a reason, no? 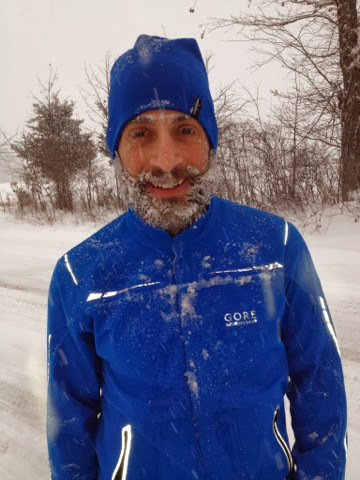 I have a new piece of gear this winter, though, that's been getting me out the door more consistently on those near-zero days: my GORE Essential Windstopper soft shell jacket. GORE is known mostly for their cycling apparel, and I'm sure you could run in their bike stuff, or bike in their run stuff, or whatever. This one is from their running collection, but it doesn't matter. It's a soft shell jacket, which means it's nice and stretchy and flexible, without the limitation of range of motion you often find with windproof outer layers. It is very lightweight. It is, as the name implies, windproof, and though it makes no claims to be waterproof or even water-repellent, I've found it to be surprisingly moisture-resistent while running in a variety of conditions. I did have a recent 15-miler with my friend Ian during a fairly steady downpour that overwhelmed it a bit, but I'll take it. with a short sleeve t-shirt AND NOTHING ELSE. The last thing I'll say about it is, it's damn sharp-looking. I'm not sponsored by GORE (though I certainly wouldn't mind! ); I bought this jacket with my own money. You should too. I'm in the process of putting together my 2014 race schedule. I've got a pretty good sense of what I'd like to run, but I'm already wait listed at one of my target races, and a couple of the others haven't opened yet, so I'll wait a bit until I post a full 2014 schedule on the site. My first race, though, will be the Mount Mitchell Challenge in Black Mountain, NC on February 22. Mount Mitchell is the highest peak in the eastern US, and the Challenge is a 40-miler to the top of the mountain and back. It's a great race that I ran for the first time in 2011, when I had a really good day, and I'm hoping to have another good one in four weeks. Plus the race is just outside Asheville, aka Beer City USA, so, you know. I used to work Coach Roy Benson's running camps in Asheville when I was a collegian, and it remains one of my favorite mountain cities. Actually, when I was a high school camper there, in 1991, my counselor was a local triathlon hotshot named Jay Curwen...who is now the race director for Mount Mitchell.